Which variety is this #1181 Runnymede Library stamp?! 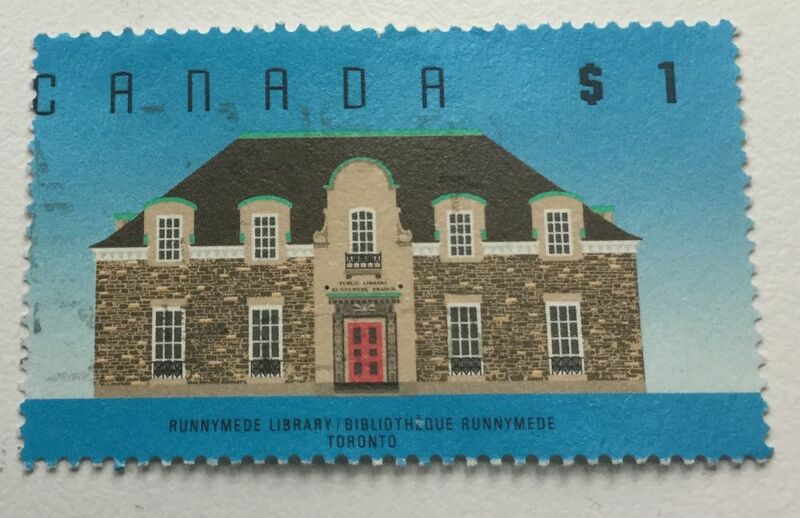 While rummaging through an old box of stamps, I found this #1181 Runnymede Library stamp. As you can see, the text is on the left side of the stamp. Since the font is black, it would be printed by 'BABN'. The lettering in your pic does appear black to me, which would make it simply Canada #1181(5May1989) in the Unitrade catalog, and no other minor variety. That would be BABN printing plate 1, which is considered the major variety. As far as the text being close to the left side of the stamp, the entire design is off-center toward the left. Had the perforations been shifted more (for example, so that the "C" appeared on the right side of the stamp), then the stamp would have a modest premium (i.e., a few dollars for a used stamp). But the current degree of shift only makes it a poorly centered stamp, and therefore normally of significantly less retail value than a well-centered stamp. There's often a fine line between a poorly centered stamp and an EFO with a modest premium.